Thanks to lower gas prices and a booming economy, pickup trucks and high-performance SUVs are enjoying a great deal of attention from American consumers. Passenger car sales in general have been on a slow decline since 2008, but off-road trucks and SUVs sales have actually been increasing during the same time period. New engineering technologies have made off-road vehicles more livable and even more luxurious than they could have been in the past, leading many auto consumers to give them a second look. This desire for cars that are both comfortable and capable of navigating bumpy, unpaved terrain has made for a challenging assignment for auto engineers. The result has been a range of innovative, exciting, and fun trucks and SUVs expected to hit the market this year. Here is our list of the top five off-road vehicles set to be released in 2019. After being taken off the market in 2011, the Ranger has been reintroduced by Ford in order to compete for a new kind of off-road vehicle consumer, one who uses their truck for leisure rather than for work. Think of the Ranger as a mid-sized alternative to the gigantic Ford F-150. The new model comes with front and rear steel bumpers, the popular Trail Control system, as well as upgraded tires. The Colorado ZR2 Bison improves on the original Chevy ZR2 design to deliver a pickup truck that is exceptionally capable of handling all off-roading adventures. The Bison features five skid plates to protect vital parts of its undercarriage from jagged, rocky terrain, as well as steel front and rear bumpers. The Bison represents an attempt to build upon the already formidable ZR2 off-roading vehicle, with an improved approach angle, extra 2-inch lift, and a class-exclusive diesel engine. Built in 1979, Mercedes decided the G-Class was in need of an update. The 2019 edition represents a complete rebuild of the old model, though much about its appearance remains the same — including its iconic shape. But while the outside keeps the classy look that is essential to its prestige, the car is designed to be all business off the road, offering standard 4-wheel drive and a twin-turbo V8 engine with 416 horsepower. The G-Class comes at a significant price, but that cost only makes it a better luxury vehicle for those who aren’t afraid of getting a little mud on their hands. 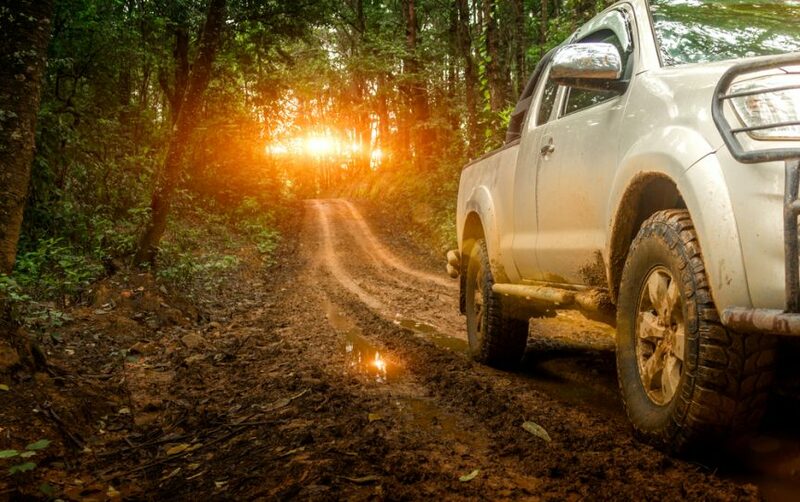 While all these cars offer drivers the power to traverse even the most treacherous of terrains, if you’re a municipality or business that services unpaved roads, the last thing you want is for them to be a challenge worthy of a world-class truck or SUV. That’s why Midwest Industrial Supply, Inc., offers these organizations the world-class dust control products and application strategies necessary to ensure that you don’t need 4-wheel drive or steel plates to travel down your dirt or gravel road. With over 40 years of experience creating pavement-like strength from unpaved road materials for enterprises, municipalities, and townships, we at Midwest are fully prepared to deal with any issues that are sapping the strength of your gravel or dirt road. Our products mix with your road’s native soils to engineer a durable surface that resists erosion, moisture, and pressure. And we’ve helped hundreds of our clients improve safety, cut down on maintenance costs, and extend the life cycle of their roads. There’s no need to ford rivers and mountains to find a better dust control solution — just call Midwest for a custom program that’s right for your needs.